Guest post by Kathryn Desplanque, a third-year Ph.D. student inArt, Art History & Visual Studies. Her work focuses on satirical etchings and engravings in late eighteenth-century and early nineteenth-century France. This semester she taught a Writing 101 class on modern caricature. 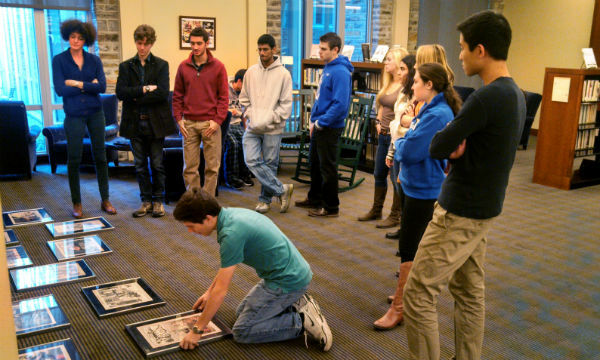 Students arranging artwork for the Student Wall exhibit. Photo courtesy of Kathryn Desplanque. In my Writing 101 class, “Laughing Matters: Interpreting and Contextualizing Modern Caricature,” I wanted to give my students a chance to interact with the rich cartoon periodical collection of Perkins Library and the Rubenstein Rare Book & Manuscript Library. The cartoon periodicals contained therein, of which my students were particularly drawn to the American Puck and the British Punch, contain gorgeous chromolithographed or woodblock engraved caricatures. These complicated visual objects necessitate interdisciplinary research, and through them, I have encouraged my students to engage with the material history of print culture and the periodical press. I also wanted to give my students an opportunity to explore a kind of writing which I personally find to be tremendously challenging: writing and curating for public audiences. To prepare our Perkins Student Wall exhibit, the students of W101 “Laughing Matters” reverse-engineered genre guidelines for label writing, produced magnificent labels, curated and hung our exhibit, Reading Between the Lines: Comical Interpretations of the Nineteenth Century. They did all of this with careful attention to audience experience: they built sub-themes into our exhibit, and hung the caricatures so as to take advantage of the colors and perspectival lines of their pieces. Throughout the curatorial process, I feel like I’ve learned the most of all, thanks to the candid and insightful discussion we’ve had throughout the semester. Check out the exhibit! Reading Between the Lines will remain up on the Student Wall on the first floor of Perkins Library through the end of the fall 2013 semester.